Don’t be fooled by the relative calm across financial markets: The inputs in the global supply chain are flashing warning signs. 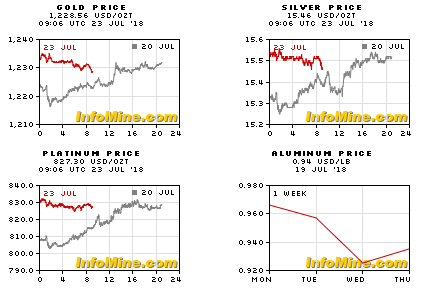 Commodities have approached correction territory, under pressure again on Thursday in the face of the resurgent dollar and lingering global trade tensions. Among the recent milestones: Copper dipped below $6,000. West Texas Intermediate crude tested $70. Gold crashed through $1,220. 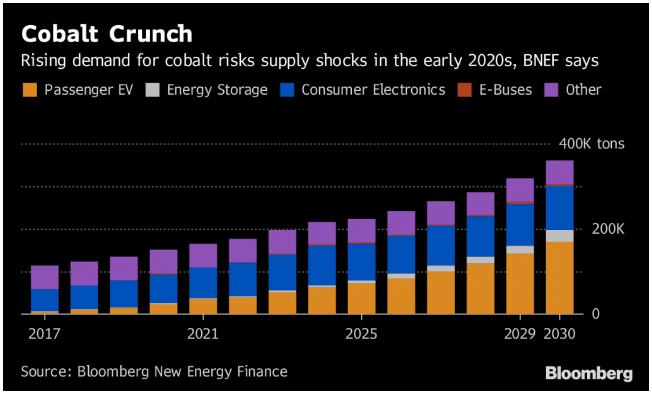 ⦁ It’s not just hedge funds that have noticed the cobalt boom — thieves have too. About 112 metric tons of cobalt was stolen from a warehouse in Rotterdam owned by Vollers Group Gmbh earlier this month, according to a statement from the Minor Metals Trade Association, a U.K.-based industry group. At today’s prices, the loot is worth almost $10 million. Unlock essential intelligence on how global mining companies allocated their exploration budgets in 2017. Global spending on the search for nonferrous metals rose to an estimated US$8.4 billion in 2017, compared with US$7.3 billion in 2016. 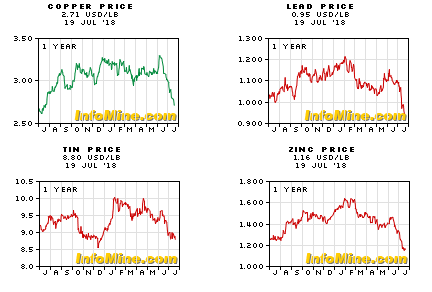 This was the first annual increase in exploration spending after four consecutive years of declining investment in the search for nonferrous metals. According to data collected for S&P Global Market Intelligence’s Corporate Exploration Strategies series, gold followed by copper, had the highest allocations of exploration budgets in 2017. Despite an increase in global exploration budgets, grassroots share was at record low in 2017. S&P Global Market Intelligence expects the global exploration budget for 2018 to increase by a further 15% to 20% year over year. For an overview of world mining exploration budget trends, download the complimentary infographic. SANTIAGO, July 21 (Reuters) – Labor negotiations at Chile’s Escondida copper mine, the world’s largest, are frozen without signs of progress toward an agreement just over a week before the current contract expires, the union said in an internal message to its members. The union said mine owner BHP rejected union demands made last week, raising the prospects of a strike at the mine for the second straight year. Last year’s 44-day strike prompted a rise in global copper prices and harmed the economy in Chile, the world’s top exporter of the red metal. Vale’s Sudbury Operations will spend $42 million on exploration in the Greater Sudbury Area, doubling the company’s exploration spend from a year ago. The company plans to have 13 drill rigs and about 30 active exploration projects operating in the area. Vale’s outlay is part of a larger trend of increased exploration spending in Canada. According to Natural Resources Canada, exploration spending will increase in Canada by 6.0% in 2018 to hit $2.2 billion this year. 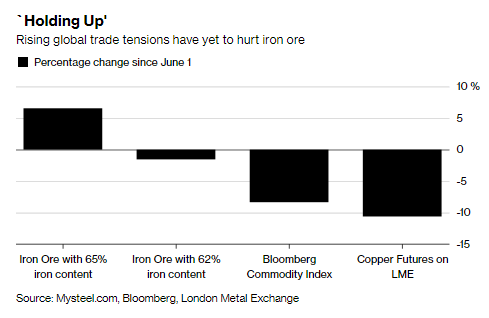 Iron ore’s become the odd man out as a spike in global trade tensions hurts commodities, with importers in top user China scooping up cargoes to feed booming mills and the government intensifying an anti-pollution drive. That’s helped benchmark prices to stay the course. 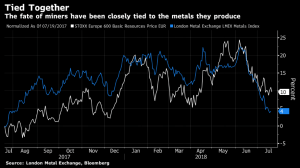 While copper in London is headed for a sixth weekly drop and the Bloomberg Commodity Index has swooned from a May peak, spot 62 percent iron ore has maintained its run in the $60s a metric ton. 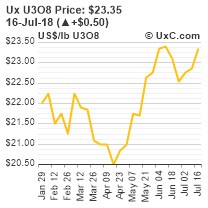 High-grade iron ore has done even better, ascending into the $90s and hitting the highest level since March. LONDON/TOKYO (Reuters) – Panasonic Corp (6752.T) said it was unable to determine how much of the cobalt used in batteries it makes for Tesla cars comes from Cuba, a country subject to U.S. sanctions, and that it had suspended relations with a Canadian supplier as a result of its concerns. The Japanese electronics maker, the exclusive supplier of batteries to Tesla Inc (TSLA.O), made the comments following questions from Reuters about whether the batteries contained Cuban cobalt. The latest Mining Charter, which is aimed at sharing the benefits of the country’s mineral wealth more equally among South Africans, doesn’t provide solutions to the industry’s challenges and will make it difficult for companies to buy and sell assets, Pityana said Thursday. Much of South Africa’s mining industry is struggling with rising costs and faltering metal prices that have forced producers to slash thousands of jobs and shrink production. The Alaska Department of Natural Resources is inviting residents of Yukon-Kuskokwim Delta to submit their comments regarding Barrick Gold (TSX, NYSE:ABX) and NovaGold Resources’ (TSX, NYSE-MKT: NG) Dolin project by August 7, 2018. The public is being asked to review and provide feedback on Donlin’s reclamation and closure plans, as well as the miners’ plans to pay for cleaning up the mine waste under the waste management permit. 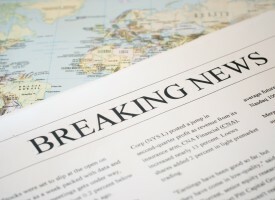 The documents were released back on July 9, 2018. The reclamation and closure plans refer to the objectives and techniques under which the lands disturbed will be reclaimed once resources have been exhausted at the mine. For example, a periodic third-party environmental audit shall be completed during the final year of the permit term or sooner if final closure starts during the permit term. 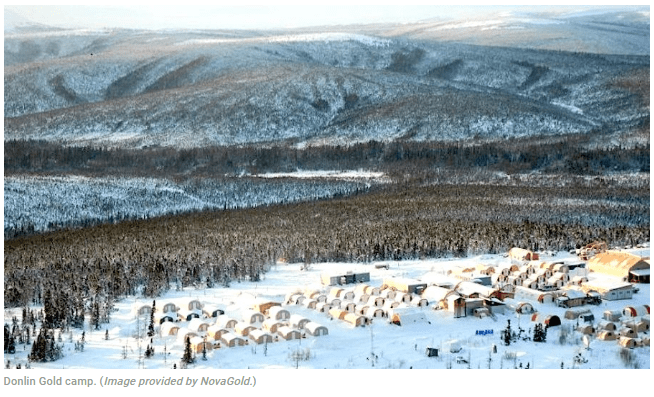 Donlin Gold, owned in equal parts by subsidiaries Novagold Resources Alaska and Barrick Gold U.S., is proposing the development of an open pit, hard-rock gold mine in southwestern Alaska, about 10 miles north of the village of Crooked Creek. One of the world’s largest, highest grade, known gold deposits, Donlin contains 39 million ounces of gold in the measured and indicated (M&I) resource categories and is expected to produce approximately one million ounces of gold per year for about 27 years. 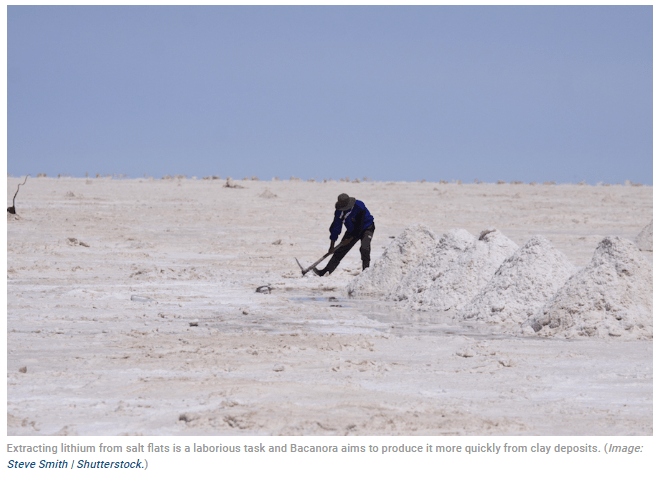 Lithium exploration and development company Bacanora Minerals (LON:BCN) won’t go ahead with a proposed $100 million share sale, citing volatile prices for the battery raw material as the main reason for the u-turn, it said Thursday. Earlier this week, the company had announced the plan saying it would help it help fund the construction of its 17,500 tonnes-a-year lithium carbonate mine in Sonora, Mexico. 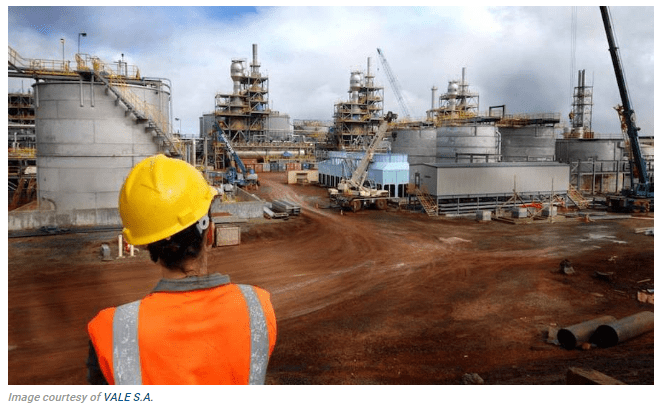 “Challenging market conditions have led us to take the decision not to proceed with the placing at this stage,” chief executive Peter Secker said in the statement. Initially, investors reacted negatively to the news and the company’s shares dropped in London from 80p to 67p. The stock ended up closing 4.34% higher to 69.7p. Investor are growing increasingly concerned about a wave of new lithium projects sprouting up from Australia to Nevada, which could put pressure on prices. Bacanora said it will now focus on completing the Front End Engineering Design, while talks are ongoing with several additional parties to find alternative funding.